Despite its appearance, this is not a planetary nebula, but a bipolar nebula embedded in a giant molecular cloud and star formation region ionised by an O8 star, Sh 2-106 IR. Avedisova catalogs this region as SFR 76.38-0.61, with 49 distinct components, including 4 masers. 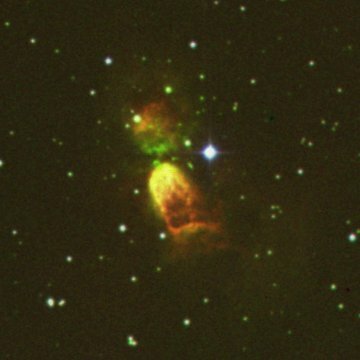 You can see a radio image of Sh 2-106 here, and a spectacular optical/infrared composite image here. This MSX infrared image shows that Sh 2-106 is embedded in the tip of a much larger pillar of gas and dust. Sh 2-106 may be part of the Cygnus X complex at 1700 parsecs and hence more massive than usually believed. This is a giant molecular cloud ionised by an O8 star, S106IR. SIMBAD gives an O9.5 class for SH 2-106 IR and notes that it is associated with an infrared star cluster, [BDB2003] G076.37-00.61.